The Summers in the Qinling Mountains in the South-East of Gansu Province are generally without heat and there are no extreme colds winter. Huixian has a generally temperate and mild climate. Rainfall: annual precipitation 100 millimeters, with rainfall concentrated in summer. Average Temperature: No Data Available. 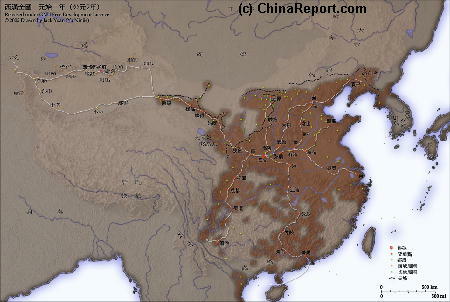 Geographic & Historic Maps on Huixian, Silk Road and related Regions of Gansu Province. "Tracing Marco Polo's Northern Route"
The beautiful Photo-Journey of Wang Miao and Shi Baoxiu, all the way from the Pamir Highlands in Central Asia, through North China to Beijing along the Silk Northern Route. A jewel of a Book !! Please browse around the Town of Huixian and wider Area using our Geographic & Historic Maps. Find out more about the City and Area through our many Photographic Reports on the main historic landmarks and Monuments and their rich history. A Full listing of Huixian City Landmarks, Monuments, Hotspots and other sites of importance in alphabetical order. Search through the list to find your Full Report and Photo-Virtual Tour of each monument or landmark within the Town. Huixian has NO railway station and the only Transport is by Bus from nearby Jialing Station to the East, through Shoufei Train Station of Fengxian in Shaanxi Province (reachable through National Road 316 eastward out of Town) or directly from Tianshui by Bus. Overview Map of Gansu Province and surrounding area's. Click for Full Sized Version. situated someways North of Huixian, then the Town of Jialing -which is situated downstream on the Jialing River-, and Fengxian (formerly: Shuangshipu), situated to the East just across the border inside of Shaanxi Province. Huixian literally translates as 'County of the Hui' and today remains a predominantly Muslim county within Gansu Province. The dominant Ethnic Group are the Hui. Generally speaking poverty levels in Huixian County are high and education levels low. Women in Hui Households in Huixian County live according to strict (islamic) rules and remain mainly within the house and outside of public life and politics, although modernity has had some moderating effects. Although only a small County Town for most of its history, Huixian owes its earliest historic successes to the nearby pathway of the ancient Silk Road which passes just some 100 kilometers North of Huixian. The Silk Road pathway led from its nearby starting point the City Xi'An (Chang'An) -for a long time the prospering Chinese Capital and a City of a million citizens westward into Gansu Province and the crossing point of the Yellow River at the Provincial Capital of Lanzhou. Located off the main route, but nearby several strategic passes leading into neighboring provinces, the small County Town of Huixian found itself sharing some of the Glory of the main trading centers. The first written recorded mentionings of Huixian County were made in relation to the Wudu earthquake, which measured 7+ on the Richter scale and occurred in 186 BC during the Rule of the Han Dynasty. At that early time the Silk Road was still under development as it were, with Kingdoms in the West brought under Tribute of the Han Throne. Population: The Total Population of Huixian County is around 210.000 who are distributed within 18 county jurisdiction townships (town) and 249 administrative villages. Not much is known of Huixian and County apart from its link with the Silk Road. As recorded, in the Year 1654 AD during the Ching Dynasty Era (1644 AD - 1911 AD) another Earthquake, the Tianshui Earthquake devastated the region. A similar earthquake (known as the souther Wudu Quake) disturbed life in the region in the Year 1879 AD. Huixian only reappears in modern history first and foremost in relation with the so-called "Long March" (October 1934 AD-October 1935AD/Early 1936 AD). Having left Jiangxi Province in October of 1934 AD embarking on the 'Long Retreat', in the winter and spring of 1935 AD Mao Zedong's First (or Central) Red Army had suffered barbaric ambushes from the Tibetans and the Hui in Qinghai Province (then part of Tibet) who were protecting their scarce resources and very livelihoods from the oncoming army, after which they fell into the despair of traversing several swamps situated in Northern Sichuan Province. Thus being decimated and demoralized the First Red Army managed to make its way into relative safety inside Gansu Province finding a temporary sanctuary somewhere West of Huixian. At the same Time, Huixian was one of the Towns on the marching route of the Second Army (Front) which marched northward alongside the First Army, and which included various leaders of the Central Party Leadership Group as well as the so called '(Central) Red Army', which was regarded as the strongest unit of the many on the march. According to the Memories of old generals and surviving soldiers Huixian was a place of rest where the Red Army resupplied itself with oil, grain and many other direly needed goods. After a devastating March with the loss of many lives to hardship, hunger and less-the enemy, Huixian was an important place where the Army was able to re-establish itself. It became the place where all three marching armies regrouped in an important episode in the founding legacy of the Communist Party of China. While the three main Red Armies -the Central or First, the Second and Fourth Armies- made a Rendezvous and replenished their ranks, an important battle for ultimate control of the Party and Army leadership was decided. In July 1935, the troops under Mao united with the Fourth Red Army which had been under leadership of Zhang Guotao since the start of its retreat west from Henan Province. A power struggle ensued within the highest ranks of the Communist Party Leadership. The main leadership consisting of the group supporting Mao Zedong wanted to move North into Shaanxi Province where it was heard there was a surviving Communist Base Area. Zhang Guotao's 4Th Army group however preferred to establish a refuge near the border with the Soviet Union and hope for their active support and resupply. While the Army rested, the Party Apparatus reorganized and important strategic Matters lay before the combined groups. Each Army had earned its credentials and each Leader and Army would demand their fair share of influence within the ranks. In command of a much smaller force, Mao carefully avoided Zhang's discovery of this fact, giving Mao Time to recruit new soldiers while massaging the party apparatchiks to nullify Zhang's influence over the subordinate commanders of the combined Communist forces of the 4Th and 1st Armies. Eventually, a new Leadership structure within the combined force was decided upon. With all main leaders gathered at Huixian, a first official Central Party Committee was established within the Communist Party. Among one of the First decisions before this Committee, the decision on where best to move next, would effectually decide who would be the main Commander of the Red Army in the Future. As expected there was disagreement within the CPC over the direction in which the troops should move and who would lead, so the two forces split up. In a dubious episode still shrouded in clouds of (Party Endorsed) mystery Zhang Guotao's Fourth Red Army, the strongest military force within all ranks was hastily sent out of Huixian on what is known as the "Ningxia Campaign". According to official explanation there were miscommunications, due to which the 4th army was unaware that the Ningxia Campaign was aborted. Thus it headed it away alone and without support. Meanwhile, the main group, now firmly led by Mao Zedong and his faithful Zhou Enlai marched directly north and on to Shaanxi Province. The 'Ningxia Campaign' followed a different route which lead North into Ningxia Hui Autonomous Region, then west into the barren lands of Gansu Province where it turned out to be a dead end, literally. Meeting the harsh winter climate, unfriendly villages, a total lack of food and the forces of Chiang Kai-shek formed by his allies of Muslim Warlords, the so-called Ma clique, the fourth Red Army was decimated. Although remnants of Zhang's forces are reported to have joined elements of the Second Red Army, eventually linking up with Mao's forces in Shaanxi, in reality very few survived to make it out on foot. Those who did deserted rather than face another such Ordeal. Thus, Zhang Guotao was eliminated as a competitor for the top job of Leader of the Chinese Communist Party and its Army, eventhough his command had been the strongest and the most numerous forming the backbone of the remaining Communist Ranks. Some sources (Sun Shuyun - 'The Long March') suggest it was Mao who deliberately sent the 4th Army and Zhang Guotao's Men and Women on a death march, in a clever and ruthless one chance throw for the ultimate chance to Rule China after the Revolution. Today's Huixian counts no less than 26 officially recognized historic landmarks and monuments dating from various Era's. The oldest among these is the site where great Tang Dynasty poet Du Fu had a thatched Hut along the Jialing River, a site where he gladly went fishing resulting in one of his greatest Poems. Other ancient monuments of the area are the Tomb and Shrine of a famous king referred to the Southern Song Dynasty and the rare preserved relic known as the Rushu plank road, a Hanging Bridge across a steep river Gorge with its earliest recorded mentioning dating back to the Northern Song Dynasty. Apart from these ancient relics there various memorial sites related to the Revolutionary Era's epic 'Long March'. In fact, inside the village of Huixian one can find the Memorial commemorating the small town as the official birthplace of the Central Party Committee (CPC) of China's ruling Communist Party. In the vicinity of the Town lies the acclaimed No.109 Railway Tunnel of the Baoji-Chengdu Railway. Unfortunatly, the tunnel is not easily approachable and one can best enjoy it while riding a train in either direction, following the valley of the Jialing River. The nearest landmark of interest is Du Fu's Thatched Cottage located downstream at Chengxian Village, and a nearby place identified as Hualong. Beyond the road through Chengxi'an further to the south lies the mysterious Moon Canyon forming the passage through the border with Shaanxi Province. At considerable distance to the North of Huixian lies one of the ancient jewels of the Silk Road, the Buddhist Monastery built inside a Mountain known as the Maiji Shan. During World War 2 Huixian is mentioned as a desperatly poor and rural small agricultural town lying within the charming surroundings of the impressive granite Qinling Mountains. In Juli or August of 1943 Huaxian Town lay on the path of famous Foreigners in Chinese History Joseph Needham on expedition and his temporary companion on the road, Rewi Alley. Needham was on the way to Dunhuang in far Western Gansu Province to personally visit and inspect the now world famous Mogao Caves. Alley, had been taking along from nearby Shuangshipu (now Fengxian) in order to scout out a new location for the Baillie School at which he was teaching, a small Indusco School which was in danger of sporadic Japanese Air Attacks as well as the press-ganging of Nationalist Armies in search of new recruits. According to Joseph Needham's Notes on the Journey, the two trucks in the expedition were stuck for several hours just outside of Huixian, attempting to cross the Jialing Jiang, one of the many fast-flowing small rivers that eventually empty into the Great Yellow River (Huang He). The children of the Baillie school, unfortunatly, were not so lucky as to travel by truck, however cumbersome the roads may have been. When the School finally was forced to relocate more westward, the pupils had to march away on foot, leading to a dramatic journey of fright and suffering. The story of the children's journey can be read in the Book "The Inn of the 6Th Happiness" by Gladys Aylward, and in 2008 was covered in the film "The Children of Huang Shi", directed by George Spottiswoode, featuring Chinese Actor Chow Yun-Fat. In 2009 Huixian remains one of the under-developed counties in the larger Province and Region. Education opportunities remain limited due to the secluded Nature of the Mountainous Region, illiteracy rates are high and Poverty remains fairly common. 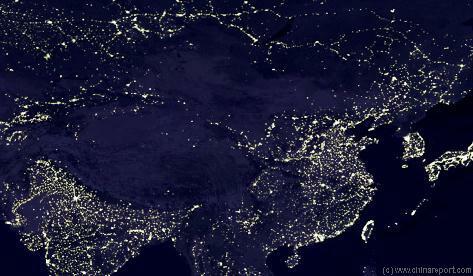 The local environment is reportedly badly polluted. Huixian is rich in rich natural resources. The county of Huixian has a Forest coverage of some 43 percent, with a resulting 175 million mu of forest and Timber reserves estimated at 2.75 million cubic meters. There are more than 250 kinds of wild plants within Huixian County, many of them of increasingly rare species. Among animals and plants under key state protection are the Takin, the White-lip deer, gibbons, and over 7 other kinds of rare animals. Huixian County is especially famed for its rare species of Campanula. One of these dubbed Campanula Gansuensis is very rare and only found in Mayanhe, a small village in the mountains of HuiXian County lying at ca. 1,100 meters elevation. Agricultural and Food products of the region are walnuts, Bansu, kiwifruit, ginkgo, Sydney, persimmon, Sheng Qi, Langya honey and other forest products, honeysuckle, Eucommia, Tianma, Bupleurum and a variety of herbs. Huixian watermelon and the "three garlic(s)" (Suanmiao, Suantai, garlic) are central to the agro-industrial base, with products from Huixian County selling in major cities nationwide. Among recently succesful products co-created or produced in Huixian County are the Longnan Spring Series wine, and less conspicuous products such as wheat flour, soy milk grain, soy protein powder, Long-licensed feed, Qili Xiang extract have also built a certain nationwide reputation. Industry in Huixian County initially consisted a liquor brewery, silk textiles industry, machinery manufacturing, printing, agricultural and sideline products processing. Food, paper, chemical, pharmaceutical, metallurgical and mining industries were later additions. More recently the Long Nanluo dam, lead and zinc mining company has formed a production Unit inside of Huixian, remaking Huixian the county into a center of lead and zinc mining and processing industries. The results for the local environment have public health have been dramatic, as in 2006 thousands were sickened and 62 children (from only 2 villages tested!) in Huixian County confirmed to be suffering from lead poisoning and have been receiving medical treatment, according to Provincial Health Officials. The smelting plant blamed for the lead pollution has since been closed down by the local government and its owner and managers arrested. Officials from China's central government have blamed local officials for allowing Huixian Hongyu Nonferrous Smelting Co, a unit of the formerly state-owned Gansu Luo Ba Nonferrous Group, to continue operating until late August. The plant, which purified lead ore, ignored basic health and safety regulations even after being ordered to stop earlier last year, according to Xinhua. No trial results are known but problems with the environment remain. Huixian, located within the hard rock Qinling Mountains is rich in mineral resources. At present there are proven lead and zinc ores, iron, gold, lead, mercury, sulphur, comments stone, marble, limestone, granite, antimony, phosphorus and other four major categories 22. At present, mainly in mineral-lead-zinc mine production capacity 180,000 tons, 20,000 tons of iron ore, 5,000 tons of gold ore, Liu Kuang 3,000 tons, 200 kg of mercury. At least one Non-Governmental Organization (NGO), ActionAid International China, is active in Huixian Town and County, focussing on issues of Women's Education, Poverty Eradication, Micro Credit and the general health of the Public. Most recently, on May 12Th of 2008 AD, Huixian and County were hit by a strong earthquake resulting in unspecified heavy damages. The Baocheng Railway (running between Baoji in Shaanxi Province and Chengdu in Sichuan Province), which passes through the lower part of Huixian County on the right bank of Jialingjiang River was temporarily blocked when a passing 40 car train including 12 gasoline tanker cars was hit by a landslide which caused the cargo train to derail inside the No. 109 tunnel leading from Huaxian to Yuguan while on fire. Baocheng Railway was closed for 283 hours in the aftermath but was restored in a targeted effort by army repair crews of the No. 61 Division. Apart from the damages to homes, there were severe landslides in the valley of Jialing River in Huixian County. Many Homes were destroyed and several villages were evacuated. Agricultural efforts in the entire region were interrupted, leading to poor harvest. 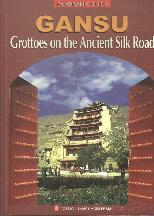 "Gansu - Grottoes on the Ancient Silk Road"
By the time of the Zhou Dynasty (11th Century BC - 221BC), the Longnan Region of which Huixian County is part had become the cradle of the Qin State which developed into the first unified State of China under Leadership of Ch'In Shi Huangdi and successors of the Qin (or Ch'In) Dynasty (221 BC - 206 BC). Finally the nation was unified and the turbulent Warring States Period (476 BC -221 BC) had come to its end. During the Reign of the Han Dynasty China would flourish and Huixian would be caught in the great changes sweeping in along the pathway of the developing Silk Road trading path to the far West and Central Asia. Huixian lies in an earthquake prone region ! You Tube Video - No.109 Railway Tunnel at Huixian blocked by Train and on Fire + More (May 2008). In Huixian County the main ethnic group are the Hui.